In this series we’re exploring the fact that the Bible is one story, and that Jesus Christ is the main character of this story, and that we are a part of this story today. 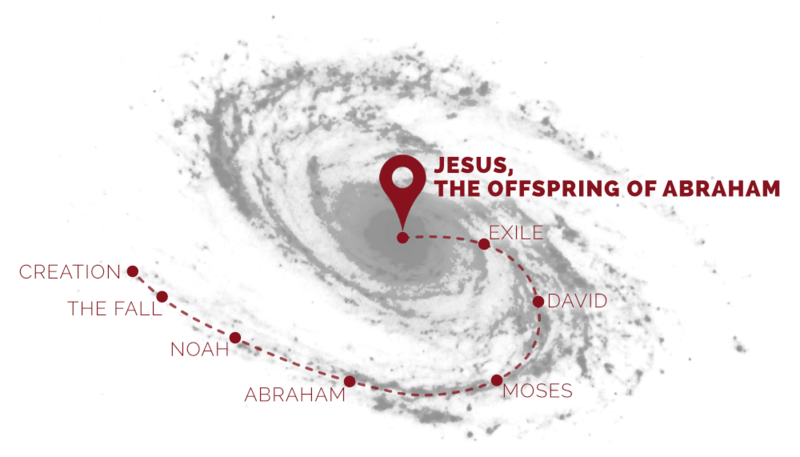 We spent September and October exploring that first statement—that the Bible is one story. We walked through the Hebrew scriptures and saw how the storyline of the Bible is built on a series of covenants that God made with His people, and how those convents all fit together and point towards one Person who would fulfill them all. And so in November and now into December we’re digging into all the ways that Jesus perfectly fulfilled each of these covenants and proved Himself to be the main character of this story. Today we’re remembering God’s covenant with Abraham, and how Jesus fulfills that covenant as the promised offspring of Abraham. We first looked at God’s covenant with Abraham back in October, and we saw that this covenant was the next major step in the story after Noah’s flood. God called Abraham out of a place of chaos—the land of Chaldeans, the land of the Tower of Babel. And God promised Abraham to make him a great nation—to give him lots of descendants. He promised to give him a land for all those descendants to live in. And the irony here is that Abraham, whose name means “exalted father,” is a 75-year old man with no kids. Because that’s how God works. He creates things out of nothing. Most significantly, God promised blessing to Abraham. He said, “I will bless you and make your name great, so that you will be a blessing. I will bless those who bless you, and him who dishonors you I will curse, and in you all the families of the earth shall be blessed” (Genesis 12:2–3). And we saw what a significant turning point this is in the storyline of the Bible. Because from the fall of Adam and Eve up until that point, the storyline of the Bible had been dominated by cursing: God’s curse on the earth, the curse on Cain, the curse of the flood, the curse on Ham and Canaan, the judgement on Babel—it was one big downward spiral. But now God picks a man and says that He will bless him, and through him, the whole earth. And so, in the biggest story ever told, God’s covenant with Abraham is the moment where the tide turns. This is the moment when the curse begins to be pushed back. This is the moment when God begins His work of reconciling the world to Himself and repairing the damage caused by our sin. Connected with this, the covenant with Abraham shows God’s heart for the nations. God uses Abraham to create one special nation—the nation of Israel—for the sake of blessing all the nations. “I will surely bless you, and I will surely multiply your offspring as the stars of heaven and as the sand that is on the seashore. And your offspring shall possess the gate of his enemies, and in your offspring shall all the nations of the earth be blessed, because you have obeyed my voice” (Genesis 22:17–18). Did you catch how specific this promise becomes? “Your offspring shall possess the gate of his enemies.” It’s a very subtle shift in the grammar there, which is why some translations miss this and say “gate of their enemies.” But a literal translation like the ESV is carefully following the Hebrew text, which is certainly speaking of one offspring. It is through this one Offspring that the promises to Abraham will be realized and the nations of the earth will be blessed. And we believe that this one Offspring has come, and His name is Jesus Christ, and that through Him all of God’s promises are being fulfilled. And in the rest of our time this morning we’re going to see how two different New Testament authors make this case: how they demonstrate for us that Jesus is this promised offspring, and what He’s done and is still doing to bring blessing to the nations. And then we’ll see some of what that means for us today. We’re going to start with the gospel of Matthew, the very first book in the New Testament. Matthew opens up in the very first verse with a statement that Jesus is the son of Abraham. And immediately he moves into a genealogy which traces Jesus’ human ancestry back to Abraham, demonstrating that He really is a legitimate offspring of Abraham. But Matthew also does something highly unusual in this genealogy. Four times he breaks the typical pattern of only listing fathers, and he specifically highlights four gentile women who were a part of the lineage of Jesus. Tamar, Rahab, Ruth, and Bathsheba (Matthew 1:3, 5, 6). This would not have been subtle to the first readers. It was an obvious way of highlighting the relationship of Jesus to the Gentile nations. And then in chapter two, we read about how three Gentile wise men from the east come to worship Him (Matthew 2:1-12). Even as a young child, Jesus is already extending His reach beyond Israel to the nations. In Matthew chapter four, right after His temptation in the wilderness, Jesus begins his ministry in “Galilee of the Gentiles” (Matthew 4:15). And the end of that chapter highlights that people were coming to Jesus from the Gentile regions of Syria and the Decapolis (Matthew 4:24-25). And it was to these mixed crowds of Jews and Gentiles that Jesus delivered the Sermon on the Mount (Matthew 5). And almost right after he finished that sermon, we hear about Jesus healing the servant of the Roman Centurion. And it was about this Roman man that Jesus said, “Truly, I tell you, with no one in Israel have I found such faith. I tell you, many will come from east and west [in other words, from the Gentile nations] and recline at table with Abraham, Isaac, and Jacob in the kingdom of heaven, while the sons of the kingdom will be thrown into the outer darkness. In that place there will be weeping and gnashing of teeth” (Matthew 8:10–12). And we could go on and on. We could talk about the healings He did for Gentiles. We could talk about how it was in the Gentile city of Caesarea Phillipi where Peter confessed Jesus to be the Christ (Matt 16:13-20). But I hope you see it. I hope you see the way that Jesus brought blessing to the nations in His ministry. Christ’s greatest act of blessing the nations, however, happened not in His life but in His death. And to hear this explained for us, let’s turn to Galatians chapter 3, which was just read for us. It’s here that the Apostle Paul unpacks for us why we should understand Christ to be this promised offspring of Abraham, and how it is that blessing comes to the nations through Him. The first truth we want to see from Paul’s words in Galatians 3 verse 8 is that “the blessing” that God promised to the nations is the gospel, the good news of justification by faith. Justification by faith is the glorious truth that God counts us righteous, counts us to be in right standing with Him, by our faith in Him, and not by our works. This is the good news. This is what we mean when we say the word “gospel.” This is what we mean when we tell people to believe in Jesus. It’s not about just having an accurate belief system—it’s about relying on God to justify us instead of trying to justify ourselves. We’re not going to have time to get into all of the reasons and rationale behind what Paul writes in verse. 8, but his point is clear: “And the Scripture, foreseeing that God would justify the Gentiles by faith, preached the gospel beforehand to Abraham, saying, ‘In you shall all the nations be blessed’” (Galatians 3:8). So when God promised Abraham that all of the nations would be blessed in Him, the blessing He was talking about was the blessing of the gospel. The blessing of a right standing with God by faith. “You are the sons of the prophets and of the covenant that God made with your fathers, saying to Abraham, ‘And in your offspring shall all the families of the earth be blessed.’ God, having raised up his servant, sent him to you first, to bless you by turning every one of you from your wickedness” (Acts 3:25–26). So the blessing that will flow to the nations is the blessing of the gospel: of repentance and forgiveness and justification. “Christ redeemed us from the curse of the law by becoming a curse for us—for it is written, ‘Cursed is everyone who is hanged on a tree’— so that in Christ Jesus the blessing of Abraham might come to the Gentiles, so that we might receive the promised Spirit through faith” (Galatians 3:13–14). Paul’s point is that all of us deserve God’s curse for our sin, and this is especially true of those who are relying on the law of Moses to save them. But Christ redeemed us from the curse of the law by becoming a curse for us. He was cursed by God for our sin when He hung on the tree. He took our curse for us. We were prepared for this, weren’t we, by Genesis chapter 15? Do you remember, how God made a series of promises to Abraham, and then he had Abraham take three animals and cut them in half (Genesis 15:7-10), and God’s presence came and passed alone between the animal pieces (Genesis 15:17)? But by passing alone through the pieces, God was promising that He would pay, by death, for Abraham’s failure to be a faithful covenant partner. And the Son of God made good on that promise when He willingly went to the cross and His body was broken and His blood was shed. For Abraham’s sins. This is what Romans 3:26 speaks of, when it talks about the sacrifice of Jesus on the cross, and says, “This was to show God’s righteousness, because in his divine forbearance he had passed over former sins” (Romans 3:26). God passed over the sins of Abraham and David and so many others. They did not receive the curse they deserved. And that’s because God was waiting for it to fall on Christ. So this is how the blessing of justification comes to us. It comes to us, despite our sin, because Jesus took the curse for our sins onto Himself on the cross. And so we read, in verse 13, “Christ redeemed us from the curse of the law by becoming a curse for us,” and then in verse 14, “so that in Christ Jesus the blessing of Abraham might come to the Gentiles” (Galatians 3:13–14). So, the blessing God promised to Abraham is the blessing of the gospel, and this blessing comes to us on account of the sacrifice of Christ. Is it not clear, then, that Jesus must be the promised offspring who brings blessing to the nations? And this is exactly what Paul says in verse 16. “Now the promises were made to Abraham and to his offspring. It does not say, ‘And to offsprings,’ referring to many, but referring to one, ‘And to your offspring,’ who is Christ” (Galatians 3:16). This is crystal clear. There’s one offspring, and it’s Jesus. And He brings blessing to the nations by dying on the cross for their sins so that they can be justified by faith. “Worthy are you to take the scroll and to open its seals, for you were slain, and by your blood you ransomed people for God from every tribe and language and people and nation, and you have made them a kingdom and priests to our God, and they shall reign on the earth” (Revelation 5:9–10). That passage is describing the fulfillment of the covenant with Abraham. The blessing of salvation flowing to the nations through the death and resurrection of Christ. That’s how this all comes together. But we haven’t quite closed the loop. We’ve seen that Jesus died for people from every nation so that they can be justified by faith. This is the blessing promised to Abraham. But in order to receive this blessing, those people from every nation still must believe. They must have faith. “And how are they to believe in him of whom they have never heard? And how are they to hear without someone preaching? And how are they to preach unless they are sent?” (Romans 10:14–15). You see where we’re going with this? In order for the nations to be blessed in Jesus, people need to go tell them about Jesus. And so with that thought firmly lodged in your brain, turn back to the very end of the gospel of Matthew, to what is probably one of the most important passages in the whole Bible in terms of understanding how God’s promises to Abraham are fulfilled. , baptizing them in the name of the Father and of the Son and of the Holy Spirit, teaching them to observe all that I have commanded you. And behold, I am with you always, to the end of the age” (Matthew 28:18–20). Do you see it? The Great Commission—the command to go make disciples of all nations—is the way that the covenant with Abraham gets fulfilled. The nations of the earth are blessed in Jesus when we go and make disciples of them. And that means that the Covenant with Abraham is still not fulfilled, completely. It’s still a work in progress. Because there are still peoples and nations where we haven’t made disciples yet. We haven’t finished the great commission. And this is the reason why there is an “already” and a “not yet.” This is the reason that there is a gap in between the first and the second comings of Christ. Because of the mission. Because Jesus entrusted the fulfillment of His covenant with Abraham to us. And there are still people from tribes, languages, peoples and nations whom He died for on the cross and who have not believed yet because people haven’t gone to tell them. And this is our job: to get to work to play our part in fulfilling this 4,000 year old promise. Now there’s a lot to say here, and much of it will need to wait for the new year, when we’ll spend more time exploring what this all means for us. But I want to touch on two of those points for us this morning. The first one is this: if we as a church are really going to play our part in fulfilling the promises to Abraham, then we cannot be content to just be a church that supports missionaries. We must strive together to be a church that sends missionaries, and I would add, to unreached peoples. Our success and faithfulness should not be measured by our seating capacity but by our sending capacity. We must embrace a culture of going, a culture of leaving for the sake of the gospel. And again, more on this in the new year. Second, if we as a church are going to play our part in fulfilling the promises to Abraham, and if we are going to follow the example of Jesus in His heart for the nations, that means that we must begin by having a heart for the nations here at home. And therefore, there must be zero tolerance among us for attitudes of racism or nationalism. I’m a white Canadian and I have grown up here in Western Canada surrounded by mostly white people, and my experience tells me that there is a lot of racism in the Canadian church. It’s one thing for a citizen of Canada to talk that way. But we are not primarily citizens of Canada. We are citizens of the kingdom of God. And so we can’t just think like the rest of the world does. We should have zero interest in preserving some perfect idea of a white Canada. We should have zero interest in protecting “our way of living.” Jesus told us to lose our lives for His sake. And so we should be welcoming people from other countries, whoever they are, with open arms. Because the truth is that if more of us were more obedient to Jesus, we would be going to them long before they were coming here to us. Could it be that God is using immigration to keep His promise to Abraham in spite of our disobedience? And here’s what’s perhaps the most ironic fact of all: if your skin is white, you’re the children of immigrants to this land. There were people here before us. And you’d better believe that your forefathers changed their way of living when they came here. Which just makes any hint of racial prejudice towards the First Nations peoples that much more disgusting. As the people of God we have zero excuse for racism and we must have zero tolerance for it. And my experience tells me that the Canadian church has a long way to go on this file. So what do we do about this? What should you do about this? It starts with confession and repentance. We need to ask God for forgiveness, and ask for a change of heart. And then, we go do something about it. It’s not hard. This week, just go talk to someone who’s different than you. I had a life-changing conversation several years ago when a man who was a different ethnicity sat down beside me on a park bench. And as soon as he sat down a bunch of other people around us got up and left. And he just opened up to me about how hard that was—what it was like to have people avoid him and keep their distance everywhere he went. And since that night I’ve made a point of intentionally not avoiding people who look different then me. If I’m at the grocery store, and there’s two lanes open, and in one of the lanes there’s someone who is from a different ethnicity than me, I’ll pick that one. And I won’t keep my distance. And I’ll do my best to be friendly and say “hi” and just treat them the way I’d treat anybody else. And I’m not doing anything special when I do that. Jesus did something special when He died for people from that nation. And so it should be normal for His people to care about the nations and go out of our way to show His love for them. So we’re going to pray here to close. And then we get to celebrate another baptism. This person has had the blessings of the gospel come to them through the death of Jesus, and we're going to watch them make His faith in Christ official. And as we sing that song, think about God’s heart to bless the nations right here in Nipawin, and what you can do about that even this very week.